Every democratic country has its own democratic challenges. But autocratic regimes are all alike. No one puts more faith in the accuracy of this assertion than protesters throughout the Western Balkans, who have been rallying in the streets over the last couple of weeks. Inspired by the success of North Macedonia’s “Colorful Revolution”, which led to the overthrow of Nikola Gruevski’s regime through democratic elections in 2016 without shedding a drop of blood, protesters in Montenegro, Albania, and Serbia are surely hoping for a “Macedonian scenario”. The only problem is that North Macedonia has recently undergone three different political “scenarios”, which are not equally replicable or desirable. Given the enormous turbulence in Macedonian-Serbian relations over the last couple of years, it is particularly tempting to examine the replicability of each of these three “scenarios” in present-day Serbia. 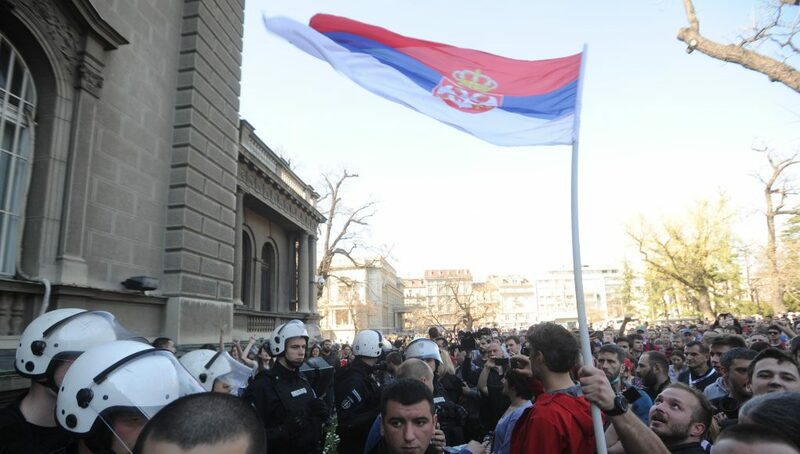 Just in the last two years, Macedonian-Serbian relations have featured anything from the presence of a high-level Serbian intelligence official at the storming of the Macedonian parliament in 2017, the temporary withdrawal of Serbian Embassy staff in 2017, and Serbian Defense Minister Aleksandar Vulin’s recent accusations of intelligence operations against Serbia being conducted in Skopje. 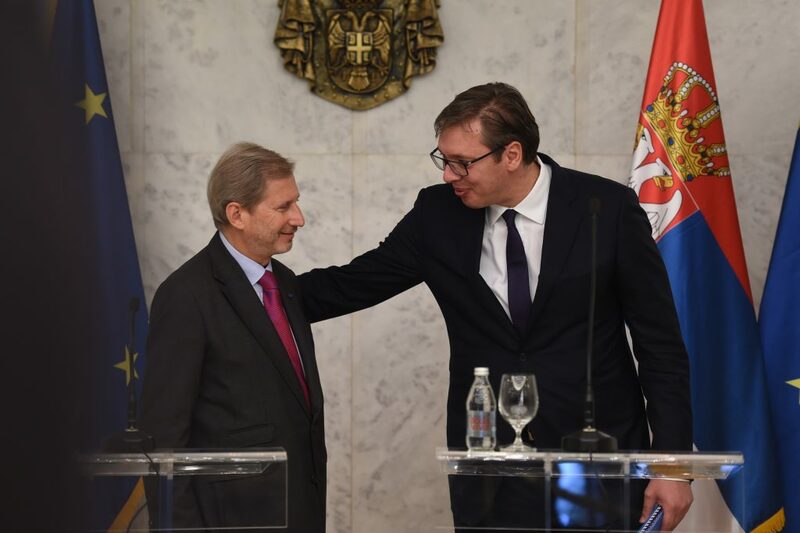 Yet, the main role of North Macedonia in Serbian domestic politics has been symbolic: it has been part and parcel of President Aleksandar Vučić’s fearmongering. Having drawn a series of dubious analogies between North Macedonia and his country in the past, it was again Skopje that came to Vučić’s mind in his first statement after some of the “1 of 5 million” protesters stormed the Serbian public broadcaster RTS last Saturday. Unlike previous statements, in which Vučić warned against the dangers of a “Macedonian scenario”, this time he proposed his own “Macedonian scenario” to describe the events of last Saturday. Angered by what he perceived as an implicit Western endorsement for the incident (and for the “1 of 5 million” protests overall), Vučić denounced the alleged double standards of the West in dealing with the region. Since Western capitals denounced the aforementioned storming of the Macedonian parliament in 2017, his argument goes, then they should be equally vociferous in denouncing Saturday’s events in Belgrade. However, Vučić’s analogy ignores two crucial points of divergence: the causes of these two incidents and the objectives of the perpetrators. Let us begin with the cause. Under the rule of President and former Prime Minister Vučić, Serbia has been steadily backsliding on the Freedom House Democracy Index, falling into the category of “partly free” countries in the 2018 rankings. 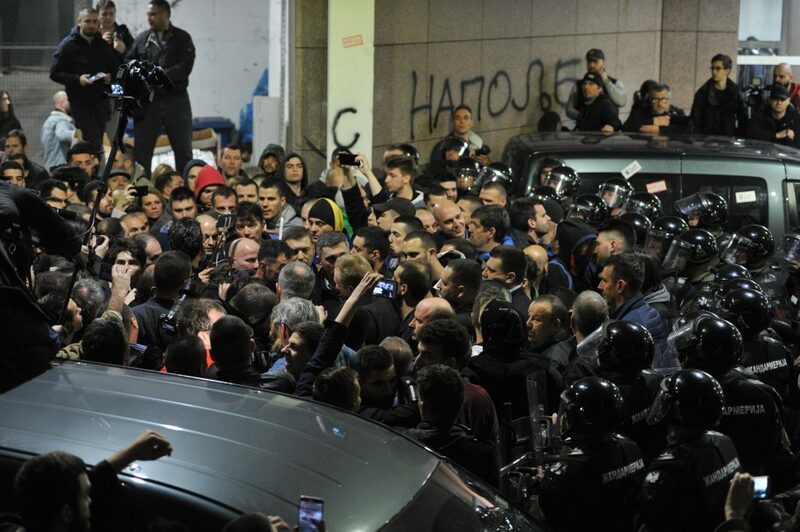 His divisive rule, constantly characterized by an inflammatory rhetoric towards opposition leaders, created the societal conditions for the brutal assault on opposition MP Borko Stefanović last November, which in turn sparked the “1 of 5 million” protests. Another vital pillar of Vučić’s rule has been his firm grip over the public broadcaster RTS, whose persistent refusal to allow screen time to the protesters provoked Saturday’s incident. 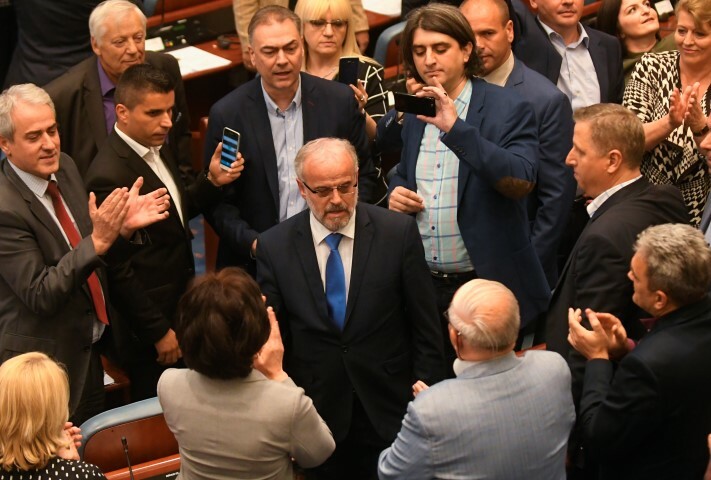 By contrast, North Macedonia’s 2017 incident was motivated by the legitimate election of the first ethnic Albanian speaker of the Macedonian parliament, Talat Xhaferi. 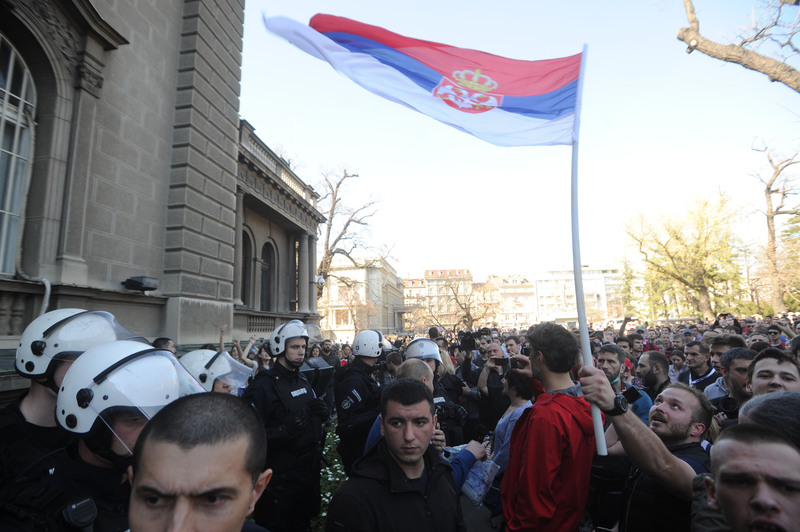 While two wrongs don’t make a right, the Belgrade protesters committed the illegal act of storming an official institution in protest for more democracy, while the Skopje protesters did so in order to block a legitimate democratic decision, thereby undermining democracy. The second difference lies in the objectives of the perpetrators. As multiple legal investigations have revealed, the Macedonian incident was in fact a systematically orchestrated operation by Gruevski’s then-outgoing regime. 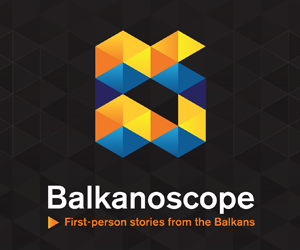 The goal was to deepen political tensions and prompt President Gjorgje Ivanov to call a state of emergency, thereby delaying the transition of power from Gruevski’s regime to the incoming government. The means of choice in achieving this objective was brutal violence, including the near-lethal assault on Albanian MP Zijadin Sela, which recently resulted in the issuing of a combined 200+ years’ worth of jail time for the perpetrators. In Serbia, details about the planning of Saturday’s incident are yet to surface. Even so, the presence of prominent opposition politicians at the front lines already hints at a substantial degree of political coordination. And yet, the notable restraint from violence by the protesters signals some discernible limits to their objectives. 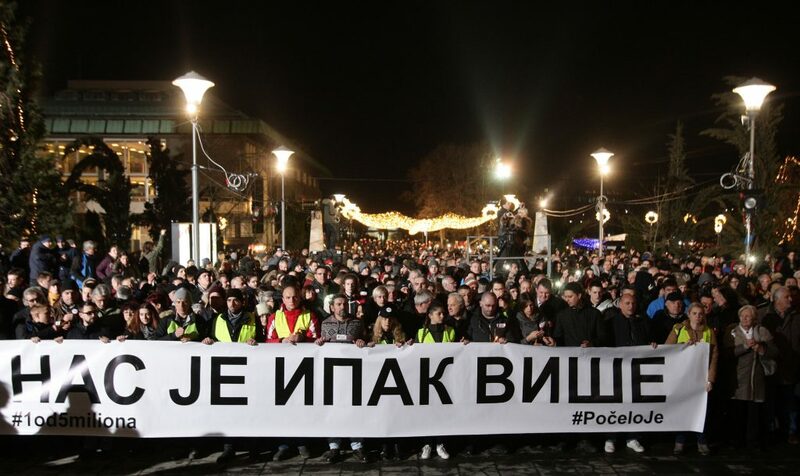 Unlike the Skopje protesters, their Belgrade counterparts engaged in a calculated escalation that was merely meant to boost the morale of the movement, which has so far failed to extract any of the desired concessions from the Vučić regime. Violence was deliberately eschewed as it would have cost the protesters popular legitimacy and harmed their objectives. This stands in stark contrast to the Macedonian case, where violence was an indispensable condition for the fulfilment of the desired objectives. But the storming of the Macedonian parliament is not the “Macedonian scenario” we are used to hearing about from Vučić. Ever since his presidential campaign in 2017, his favorite “Macedonian scenario” has been one he pledges to avoid: North Macedonia’s “Colorful Revolution” against the Gruevski government in 2015-2016. Footage of police forces beating up protesters in Skopje was even featured in one of Vučić’s campaign ads, accompanied by the intimidating slogan “Don’t Allow a Macedonian Scenario”. Clearly, Vučić is misrepresenting Skopje’s “Colorful Revolution” as a source of unnecessary violence rather than a civic struggle for democracy. But either way he has no reason to fear an overthrow of the Gruevski kind just yet. In 2015, North Macedonia’s “Colorful Revolution” was sparked by a massive government scandal revealing the wiretapping of 20,000 citizens, including most of the senior government officials. The plethora of power abuses revealed in the wiretaps brought hundreds of thousands to the street. Two years later, it led to the overthrow of the Gruevski regime. Both elements are missing from Serbia’s puzzle at the moment. 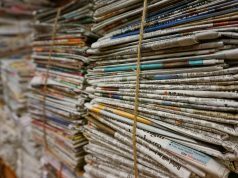 The assault on MP Stefanović, while brutal and despicable, does not carry the same political potential to serve as a mobilizing trigger for the entire population in the way the wiretapping scandal did in North Macedonia. Similarly, the “1 of 5 million” protests, while gathering thousands of supporters every weekend, have fallen way short of the 100,000 digit achieved in May 2015 in the much smaller North Macedonia. The momentum of the Serbian protests was certainly helped by Vučić’s ill-advised statement (which gave the protests their name) that he would not make any concessions even if 5 million people took to the streets. Yet, the protests are unlikely to pose an existential threat to Vučić’s regime, barring a political scandal of “Macedonian magnitude” (or maybe an unpopular compromise with Kosovo). The reason why protests in the Western Balkans fail more often than not is because the EU pays so little attention, at least not until the plot has thickened. This is the lesson of the Macedonian experience. 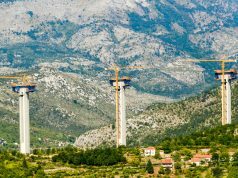 In 2014, even though North Macedonia had long been a “captured state” by this point, the EU issued a positive progress report commending the “cumulative progress” of the country and concluding that the “criteria [for accession] continue to be sufficiently met”. Back in 2014, the EU was hoping that Prime Minister Gruevski was popular enough to survive a possible compromise on the naming dispute with Greece. The EU was guided by the (mostly plausible) logic that leaders with strong patriotic credentials (such as both Gruevski and Vučić) would be better placed to endure the political fallout of compromising on the most sensitive issues facing their countries. While Brussels is right to assume that Vučić has a much better chance of feeding the bitter pill of a compromise with Kosovo to his people than any opposition politician in the country, this must not translate into unconditional support for his rule. Yet, this is exactly what has been happening so far, with Brussels serving as the key actor in the only real “Macedonian scenario” engulfing Serbia at the moment. 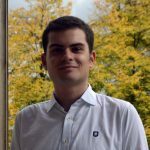 Over the last years – going all the way back to 2005 but accelerating under Vučić – there has been an embarrassingly strong negative correlation between Serbia’s progress on its EU path and the strength of its democracy. Source: “Money, power, glory: the linkages between EU conditionality and state capture in the Western Balkans” (2019) Richter, S., Wunsch, N., European Public Policy. Autocratic regimes in the Western Balkans may not be completely alike, but they are more similar than they are different. One similarity is the enormous leverage the EU holds over each and every one of them. Serbia’s path towards EU accession – and towards a better future – depends heavily on the political will in Brussels and the national capitals of the EU member states. It will not be difficult for these actors to look for excuses in Vučić’s autocratic rule to obstruct Serbia’s progress if they decide to do so. In the long run, this course of action would be harmful to the Serbian people. In the short run, it is the only way to make them get rid of their autocrat. It took Brussels a long time to realize this in North Macedonia, but it eventually did. Today, the country is free, and Gruevski is in exile in Budapest. It is time for the EU to launch its own “Macedonian scenario”. Graduate of Politics and East European Studies from University College London. Currently pursuing an M.A. program in East European, Russian and Eurasian Studies at Georgetown University in Washington, D.C.